TestMy.net is an internet speed test website that's been offering free bandwidth testing for almost 20 years! 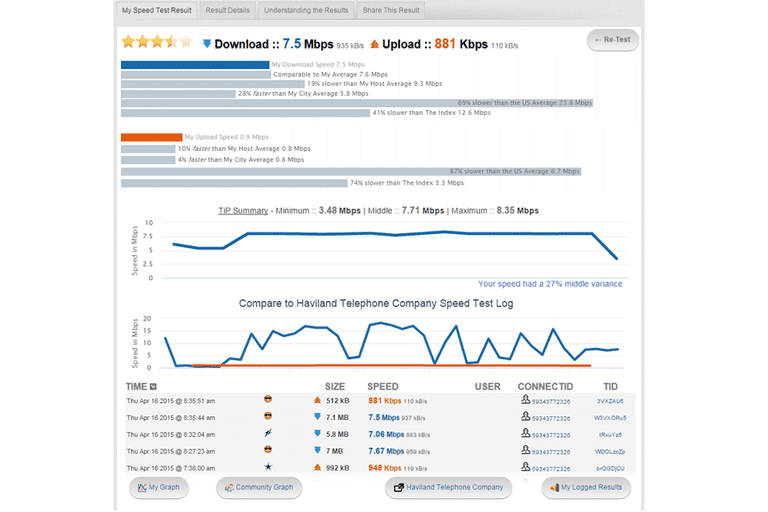 The website isn't hard to use, works in all web browsers without the need for plugins, and offers stats about your bandwidth that you may not find in other speed tests. The results of the speed tests at TestMy.net are displayed in a clear and easy to understand manner, making it simple to compare your results with other users of your ISP, people in your city, and other testers in your country. First and foremost, please know that it's super-important that TestMy.net uses HTML5 to run its speed tests. The benefit to this method, which SpeedOf.Me also uses, over websites that use Flash or Java, like Speedtest.net, is not only that it can be used on mobile devices that don't support those plugins, but also that there is no buffering between the browser and the plugin. When buffering occurs, the results aren't going to be as accurate as a direct browser-based speed test, which is what is offered here. See HTML5 vs Flash Internet Speed Tests: Which is Better? for more. TestMy.net makes it very clear that they aren't associated with any particular service provider. A speed test provided by an ISP could be providing intentionally altered results, reflecting the bandwidth speed you think you're paying for. This definitely is not true for all ISP speed tests, but it's possible that something like that could happen. After I ran my own speed test, I was able to see at what percentage faster or slower my bandwidth was than the average user of my service provider as well as the average user in my country. All the statistics provided by TestMy.net are 100% human-readable, meaning you don't need to compare charts and graphs to understand how your speeds rank.